Fantastic...You Found Us Please Drop Us A Line If You Have Any Questions. Welcome to our website, we hope you enjoy discovering our fantastic holiday park in Albury NSW. 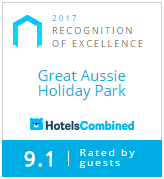 The term ‘www.greataussieholidaypark’ or ‘us’ or ‘we’ refers to the owner of this website, Great Aussie Holiday Park whose registered office is 14 Hore Rd, Bowna NSW 2644. The term ‘you’ refers to the user or viewer of our website. All trademark reproduced in this website, which are not the property of, or licensed to the operator, remain the property of their respective owners. From time to time this website may also included links to other websites. These links are provided for your convenience to provide further information. They do not signify that we endorse the website(s). We have no responsibility for the content of the linked website(s). You may not create a link to this website from any other website or document without prior written consent from www.greataussieholidaypark.com.au. Your use of this website and any dispute arising out of such use of the website is subject ot the laws of Australia and it’s territories.